Today I’ll start a series in which I am going to try to (somewhat) predict which players will start the season at which levels, which affiliates, starting with the catchers. It’s a fun exercise to try to predict who will go where to start the season. I’m going to include everyone who is currently in the organization. Of course, this is subject to change as the Twins sign more major or minor league players.. As you know, an unfortunate side of the business is that some players will not be in the organization following spring training. Hopefully this list will spur some interesting discussion and questions. Is this category a position of strength for the organization, or is it a position that needs to be strengthened? That could be through signings, but it could be something they focus on in the draft, or while watching the waiver wire throughout the season. We will start this series by looking at the Twins catchers. Jason Castro will be the starter. A year ago, he received a three year, $24.5 million contract, primarily for his pitch framing abilities. He responded with his best offensive season in four years. Chris Gimenez was his backup a year ago, but the Twins non-tendered him, and he remains a free agent. Could he come back? 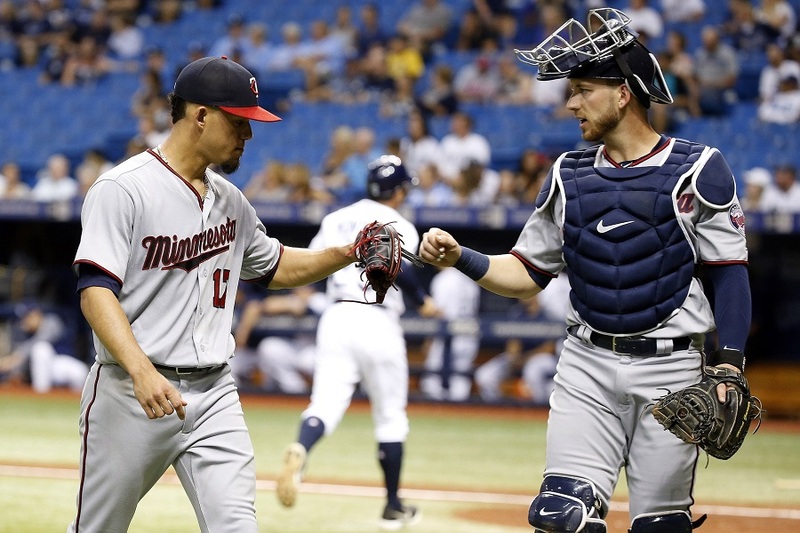 Could the Twins bring in another catcher to back up Castro? Or, could they finally give Mitch Garver a real opportunity? And how much depth is there in the Twins minor league system behind the plate? However, who will be the backup to Castro, and how will the rest of the catchers fit into the rest of the organization? Jason Castro was signed for his defensive presence a year ago, but he put up his best offensive numbers since his All-Star season in 2013. He’s the starter. As of right now, the back up catcher role is Mitch Garver’s. 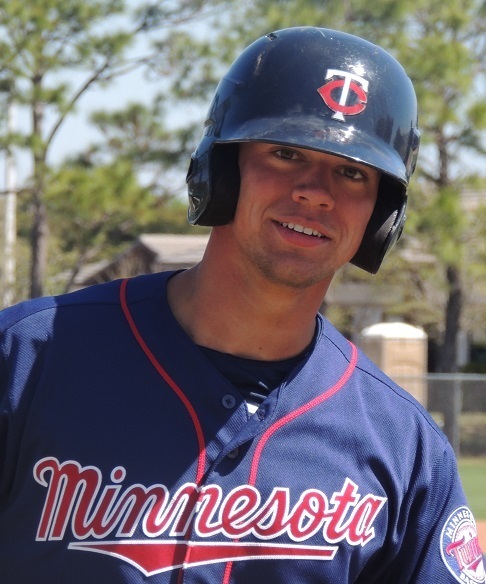 He was the Twins Daily Minor League Hitter of the Year in 2013 and again in 2017. Last year in Rochester, he hit .291/.387/.541 (.928) with 29 doubles and 17 home runs. His defense has come a long way since he was drafted in 2013 out of New Mexico. Frankly, it’s time for him to get a real shot. Castro bats left-handed. Garver bats right-handed. Garver can also play first base if needed and has enough bat to DH or pinch-hit when he isn’t behind the plate. With so many pitchers with potential (starters and relievers) who should see time in Rochester in 2018, it was important to provide them with a catcher who can help them. The Twins quickly signed veteran Bobby Wilson who has spent parts of eight of the last ten seasons in the big leagues. He’s played 324 combined MLB games for the Angels, Diamondbacks, Rays, Rangers and Tigers. He spent 2017 on the Dodgers AAA roster. Astudillo is a 26-year-old Venezuelan who spent most of his career in the Phillies organization before signing with Atlanta for 2016 and Arizona in 2017 where he reached AAA for the first time. In 36 games for Reno, he hit .342/.370/.558 (.928) with 14 doubles and four homers. Plus, it’s hard not to like a guy who is built like, well, me. The Twins added another minor league catcher who spent 2017 in the Dodgers organization (the Jeremy Zoll Effect?) in 26-year-old Wynston Sawyer. He spent 2010 through 2016 with the Orioles before playing last year for the Dodgers’ AA team in Tulsa. Brian Navarreto reached AA in 2017. He continues to be as good as anyone in the organization defensively but has not been able to turn the corner with the bat. Kevin Garcia had a real strong first half of the Miracle last year with the bat. He’s a good leader and solid behind the plate. Brian Olson missed a lot of time in 2017 due to a broken foot. It’s possible that Rortvedt could start the year back in Cedar Rapids where he started the season very slow with the bat, but he showed his mental toughness in how he improved as the season went on. There’s no questioning his defensive ability. He is very good behind the plate with a strong, accurate arm. Kranson began 2017 in Cedar Rapids and spent the second half of the season with the Miracle. Don’t be surprised if he progresses similarly in 2018, spending half the season in Ft. Myers before moving up to Chattanooga for the second half. He’ll catch, play first base, maybe some third base, possibly some outfield and certainly DH. 2017 was Caleb Hamilton’s first season behind the plate and he impressed people with his improvement. Like Kranson, he can play all over. He played third base and left field for the Kernels, and Tommy Watkins said he wouldn’t have felt uncomfortable had he needed to play him at shortstop. Banuelos came to the organization from the Mariners in December in exchange for $1 million in international bonus money. He was Seattle’s fifth-round pick in 2017 out of Long Beach State. There are questions about his bat, but there are a lot of people who think that he is nearly big-league ready defensively. Rainis Silva spent part of 2016 in Cedar Rapids. He returned to Elizabethton in 2017, a step back, but it might be a case of one step back, and two steps forward because he finally hit with the E-Twins. He hit .356/.446/.446 (.892) in 30 games. Andy Cosgrove was the Twins 17th-round pick in 2017 out of North Carolina State. He hit .221 in 21 games in his pro debut. Hayman signed as an undrafted player after putting up monster numbers throughout his college career at Valdosta State. Unfortunately, he missed the entire 2017 season due to surgery on his ACL. In his second season at Elizabethton, Robert Molina hit .253 with six extra-base hits in 25 games. After three years in the DSL, Alvarez has spent two seasons in the GCL. He played 18 games and hit .205 (and he played in one game for the Miracle). Kidany Salva was the Twins 17th-round pick in 2016 out of high school in Texas. The Puerto Rican native hit .159 in just 17 games. 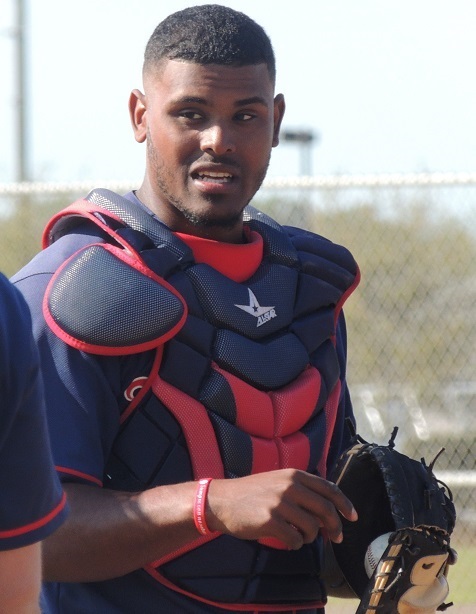 Camacho was the team’s 11th-round pick in 2015 out of Puerto Rico. He missed all of 2016 due to suspension. He returned and posted a .706 in 21 games in the GCL. The Twins signed Grzelakowski from the Utica Unicorns of the United Shore Professional Baseball League last summer and he finished the year with 12 games in the GCL. He’s worked really hard, lost a lot of weight without losing power, so he could be a sleeper. So what do you think? Who will start the season as Jason Castro’s backup? Which prospects are you most excited about in 2018? Please feel free to discuss and ask questions in the Comments below. 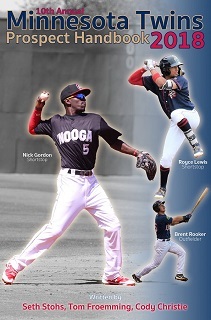 For much more information on the minor leaguers mentioned above, you can purchase the 2018 Minnesota Twins Prospect Handbook. It is available either by paperback or electronic book. Garver did not attain his .928 OPS by having a good month. He crushed the ball all year. Had Palka had such a season the fans would have been screaming for him to be called up. I fully expect Garver to be the backup catcher. On the other hand, I've read things suggesting that if Darvish signs with the Twins it may lead to the Twins signing Gimenez, as they are friends and it may make Darvish more comfortable. At that point I would expect the 27 year old Garver to be traded. If the Twins sign Darvish it may get interesting. I'm torn.On one hand, man I want to see what Garver can do.The new FO may not be as high on him as those of us on the outside are....or they wouldn't have brought in Castro on a multi-year deal.On the other hand, Giminez brought so much more to this team than just his numbers.His versatility and clubhouse/veteran presence obviously were keys to 85 wins. Curious.Do we think that the Twins are waiting on Darvish before they decide on Giminez?If Darvish goes somewhere else the #2 is Garver?And if Darvish signs the #2 is Giminez? Do you think promoting Pudge's son to the bullpen would be enough to lure him out of retirement? When did he retire? Last I heard he signed a minor league deal with the Giants in November. Or now I'm thinking you mean luring Pudge out of retirement...which would now involve a trade to get his son back. Don't think that's likely, ha. I think the official answer to that/those is... "Maybe." While it is clear that Gimenez is a clubhouse guy, Garver's got just as much versatility. Garver can catch, play 1B and even some left field. He is a better hitter so he could get time as a pinch hitter or a DH. As for the pitching thing... you would hope that neither of them would need to do that in 2018. Garver will get a chance, but Molitor seems to get frustrated quickly by mistakes on defense. The Twins clearly like his bat as evidenced by him playing 3 positions + DH last year in a small sample, but if Garver wants to stick around he has to catch/defend well. I am overwhelmed by how many catchers there are on the entire list.I would think that there needs to be some trimming. My hope is that Garver gets to show his worth and we start to see some potential movement from the younger guys that will line up for 2020! Ah, I missed that his kid wasn't in the organization anymore. But, yeah...Not a serious comment/question in the first place. Yeah, I figured it wasn't serious. I was still half awake when I read it to begin with so I'm going to say that's why I was so confused. Garver's a nice story. He was the 19th catcher selected in the 2013 draft (Turner was the 6th, Navarreto the 15th). I'm not sure we'd swap him for a single one of the catching prospects selected ahead of him, it being debatable perhaps regarding three or four of them at the most. He may not be a long-term answer, even as a backup, but it's a credit to him. and to the Twins, that he's on the cusp. Garver more than deserves a shot. He raked in AAA. Garver needs to catch, be it in the majors of half-a-season FULL behind-the-plate at AAA before becoming the sole backup or just a bench bat to put into other positions. Unless any of the other guys down the ladder would be a fulltime catcher come 2020, which I don't see. So, is Garver the potential once and future catcher come next season and holding down the majority of games behind-the-plate for years after that, or is he a guy "who can also catch" and be the super reserve bench bat. My guess is they could add a couple more before spring training. It's hard to have enough catchers for all of the bullpens that need to be thrown by pitchers. At the end of spring training, a few catchers will be released. They'll also keep a few extra at Extended Spring Training for the same reason. Another interesting article, much appreciate as always. But I have a suggestion, or rather a request: Is it possible to include captions beneath the photos, telling us who exactly is pictured? I honestly have no idea who some of these players are! As many people have already suggested...Garver has done enough to be given a shot at the big league level. I think what's more important here is to give him a shot to see if he can take over as the primary catcher in 2020 or if we will need to look elsewhere.